The Building Enclosure Core reflects a very different perspective in enclosure design. The ‘Core’ refers to all elements of the enclosure with the exception of its exterior cladding system. It is both physical construct as well as resilience exercise as it embodies the most critical elements of air, moisture, and thermal management. Traditionally the industry has maintained a cladding-centric view to enclosure design, emphasizing the roles of exterior cladding materials in establishing performance expectations. Although this view still prevails, our industry is gradually moving away from barrier approaches or mindsets that fail to account for defects (The Human Factor) or extreme conditions (The Climate Factor). We are beginning to embrace the idea that dynamic processes actually do occur within and between our assembly components. These processes involve a myriad of physical, chemical, and even biological mechanisms that affect our walls differently as we move geospatially through climate zones and temporally through seasons and the building’s service life. How our wall fares in response to these conditions will depend on the assumptions that we make in design and the care that we take in construction. Never before have these requirements been more important. Recent changes in building practices, namely those involving air barriers, continuous insulation (CI), and the growing use of low-permeable weather-resistive barriers, represent radical departures from conventional practices. The idealist sees these changes as positive and stabilizing. The wall’s environments are better compartmentalized, moisture penetration is prevented, and never shall a thermal short circuit occur. The realist sees it completely differently – a playing field riddled with pitfalls such as moisture entrapment, dew point shifts, and unintended thermal consequences. The middle ground offers little room for success or failure. For example, design criteria for the penetration of wind driven rain behind the cladding and against one or more wall planes pose far greater challenges than those stemming from problematic reservoir cladding such as stucco and brick. Likewise, hybrid insulation strategies and practices resulting in breached air barriers or exterior CI planes can create conditions that are insidious and potentially calamitous. Wind washing within well-intended rainscreens can produce circumstances for sheathing condensation. These are some of the very different considerations that place greater importance on the Building Enclosure Core. 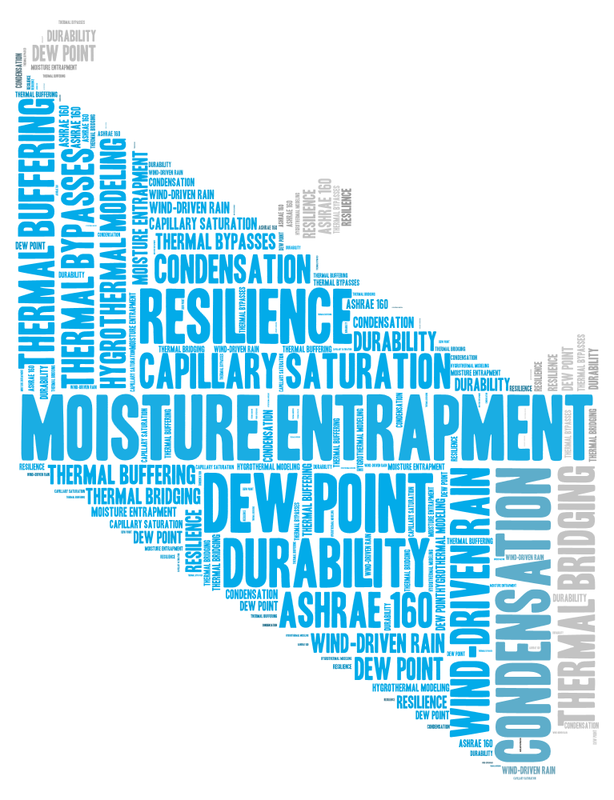 In this new age of construction, moisture resilience is now a necessity, not an option. I am not neglecting the contribution of cladding systems in wall performance. Make no mistake, they are important in their own right. The concept of the Building Enclosure Core simply serves as a mental exercise for anticipating and addressing complex hygrothermal dynamics that are expressed within component layers and their respective interfaces. By placing less emphasis on the cladding as an impenetrable barrier while also accommodating potential failures from air, moisture, and heat transport, we can begin to design around these transgressions. If we address these issues, together with the practicalities of cladding attachment and constructability, then we begin to achieve a radically simplified wall that is applicable to any cladding system and any climate. Effective mental wrangling of the Building Enclosure Core has its benefits. When done correctly it achieves near perfection by offering high energy performance with vastly improved resilience.